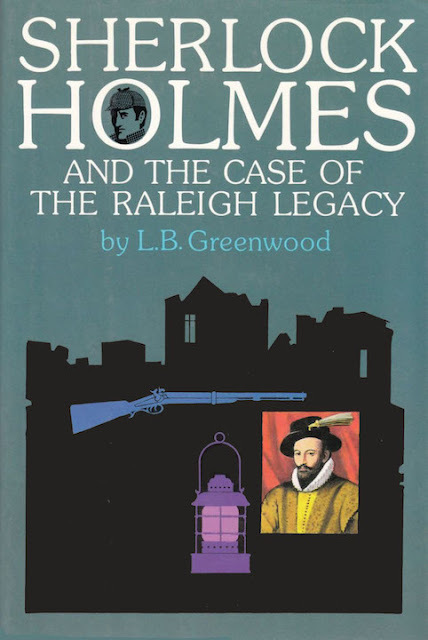 Sherlock Holmes and Dr. Watson uncover a history mystery involving Sir Walter Raleigh in this first Holmes pastiche by L.B. Greenwood. This is the hardcover released in 1986. A paperback was released a year later. This mystery, the Canadian author's first, won approval from the Conan Doyle estate. But the sure-fire plotclearly based on Greenwood's knowledge of English history sinks under the tale's flimsy construction and fancy-Dan writing. As told by Dr. Watson, the story concerns a cryptic Elizabethan note belonging to the doctor's friend Aleck Raleigh. The centuries-old relic hints at a "grate Tresur" cached at Nightsead, onetime home of the quintessential swashbuckler Sir Walter, Aleck's ancestor. Watson excites the interest of the great Sherlock Holmes in the legacy, and Holmes tackles the puzzle and also investigates young Raleigh's stepfather and the lad's wife. The detective suspects either or both might kill for the secret he digs out (at last) from Nightsead's huge stone ruins. The find is fantastic, meriting the hyperbole wasted elsewhere on innumerable mundane moments in the tale, yet Greenwood treats the shocker rather casually.